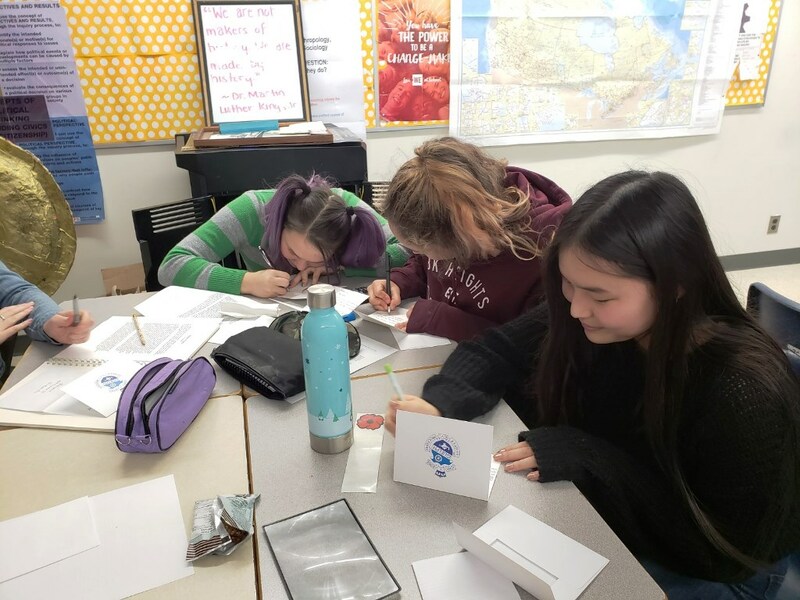 GUELPH, Ontario – A unique project is connecting students from John F. Ross CVI to soldiers who fought in the First World War. 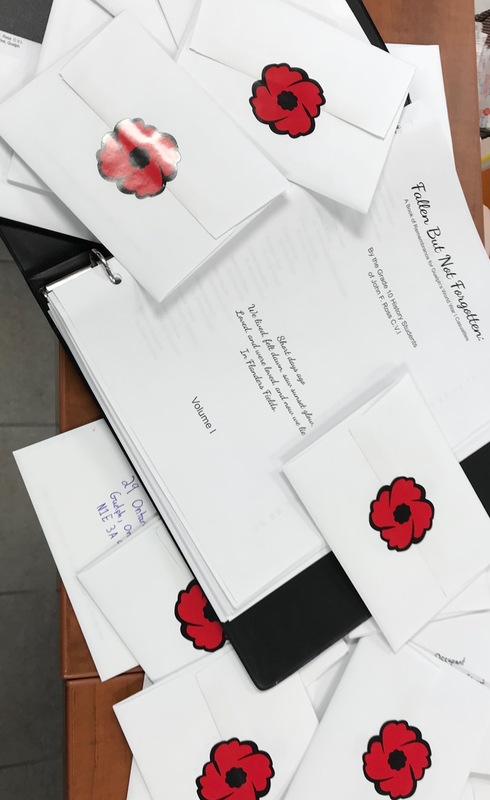 Earlier this semester, the grade 10 students selected the name of a WWI soldier who was listed on the Guelph Cenotaph and researched them using 100-year-old digitized military records. The records students used to research these soldiers are from the National Library and Archives of Canada website. Students also used a series of Guelph Mercury articles about First World War soldiers from the area. Students researched by reading the personnel records, medical records and wills of their soldier. Through the research, students had the opportunity to learn where soldiers lived, what they did before enlisting and how they died. Each student was able to access the battalion war diary for those who died in battle to gather information about the battle their soldier died in and what their battalion was doing on the day the soldier was killed in action. Some students researched the Spanish Flu and the effects it had on troops as well as Canadians back home. 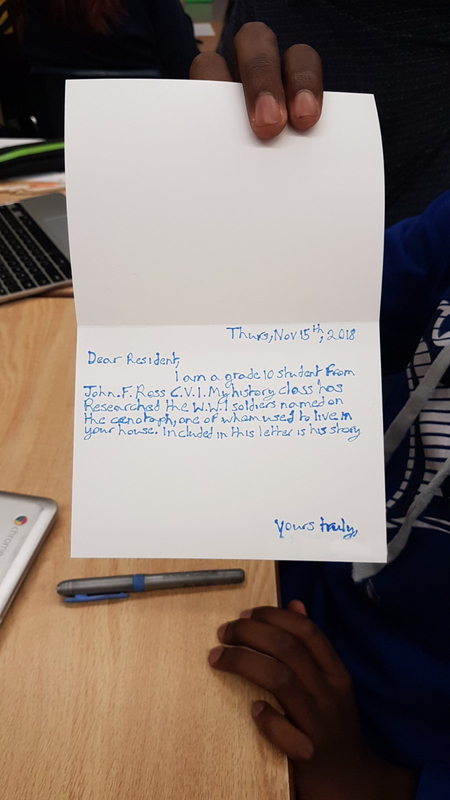 At the end of their research phase, students produced a one page biographical essay about their soldier and mailed it to the current occupant(s) living in the homes that Guelph’s fallen WWI soldiers once lived in. Some of the residences are businesses, parks or places of worship now, so letters were sent to the business, church and the closest address to the location of the park. So far, students have mailed 55 letters and are set to send out more in the upcoming months. The goal of this hands-on learning activity was to help students connect to the history of their community and understand the contribution and sacrifice the former residents of Guelph have made. In this learning experience, history was local, personal and a part of the everyday experiences of these students. Many of the students researching soldiers walk past the homes once lived in on their way to and from school. Students enjoyed the activity because it showed them the local impact of a war that ended just over 100 years ago and gave them a way to relate the experiences to their 21st century lives.